I started blogging a long time back but only started a book blog last year, October 2012. Free books definitely! And getting to know lots of authors and other book bloggers. Whenever I exchange emails or even get a response from my favorite authors, I could be such a huge fan-girl! LOL. I have eclectic taste in books so I don't have a preferred type. So far though, most of the books I've blogged about since I started are under Young-Adult or Contemporary Romances. That is a tough question. Seriously. But just to name a few, I love the Harry Potter Series, A Walk to Remember, Back to You, The Perks of a Wallflower, The Fault in Our Stars, The Temple Dogs and The Bourne Series. Personally, I'm still fascinated by the publishing industry. And so far, the best thing that has happened to me because of book blogging is that I get to see what goes on behind the scenes in the production of books. I want to be a published author someday so book blogging has given me so much insight on publishing. Thanks for sticking with us for 150 weeks! And thanks also to Rachel to asking me to co-host. Please let us know what you like or don't like about FF. We want to make sure that FF is as fun, beneficial, and useful for as many people as possible. I wish bloggers listed what genre they usually blog on the linky, especially if they blog erotica or graphic NA. P.S. I didn't mean this to sound neg or critical just to answer "what would you change"
Woo hoo! Happy 150th :) I suggested a question, don't if it's been done yet. Thanks for continuing FF! I love the chance to gain more followers! Happy 150th!! Thanks for creating this Hop. It's awesome. 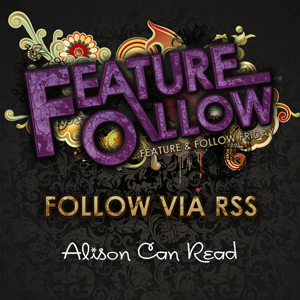 Thanks for always stopping by everyone's blog and engaging with them Alison!! Congratulations!!! This is a great feature!!! Congrats on 150 weeks! I love discovering new blogs through this feature, thank you for hosting it. Hi, Alison. I think it's perfect as is. It's the most fun I have every Friday. This is only my 5th week, but your FF makes my day rock. Congrats! Here's to another 1000! 150 weeks! I can't believe it's been so long! Woow 150 weeks! Congratulations, I really hope this blog hop continues to grow. It's so big now and I think it'd be really nice if there were more than two features bloggers. I know it'd take a lot more time but it'd be nice if one was chosen instead of just randomly picked. I'm a first-timer to this feature so hi! Congratulations on having a successful hop for 150 weeks!!! I love this hop, it really helped me become a part of the community when I first started blogging. Old follower stopping by, wishing you a wonderful weekend! Here's my FF post for this week. Happy 150th you guys!! Such an awesome accomplishment! :D This is such an awesome way to connect with other bloggers! I love the hop and thank you for taking the time to do it each week! I have always enjoyed the hop!! I don't have any changes and I can't think of any questions that we haven't already done. I look forward to the hop every week and it can't be easy for you two to put it all together what with buy lives, getting the features and coming up with great questions and activities. My hat's off to you ladies! Thanks for stopping by this week! Thanks for hosting FF for so long! It has been a blast! Congrats. New GFC follower here from The Second Thought (http://thesecond-thought.blogspot.com). Great blog! You and Rachel have done such an incredible job with this hop, and I really love participating every week :) I think the only thing I'd love to see is participants being able to submit questions for potential use, and it'd give you a break from coming up with them every week—I don't know how you do it but you have made this a very fun and enjoyable part of Friday blogging! Congratulations!! 150 weeks of awesome! I love the meme - I only wish I had joined in a long time ago! I've only been doing this for 14 weeks and am glad I got over my shyness, lol. I have an interesting question for the next week. I hope you like it.